WASHINGTON (The Nil Admirari) - Today, the Congressional Teabagger Caucus warned Americans it would punish the poor, sick, elderly, veterans, starving children, and many other groups if Democrats and President Obama did not allow teabaggers to punish women by defunding Planned Parenthood. The right-wing extremist faction of the Republican Party - the self-proclaimed "party of fiscal responsibility" - assured all Americans it would disrupt benefits to the most vulnerable members of American society, and actually cost taxpayers more money by shutting down the government in less than two days if it did not get what it wanted. "You want proof the government doesn't work? Keep electing teabaggers like me so we can shut the government down, and callously play with the lives of Americans who rely on government social programs. Oh, and we're not too keen on paying for things the government has already used," stated Rep. Louie Gohmert (R-TX-01), who also announced he wanted to be House Speaker John Boehner's (R-OH-08) successor. 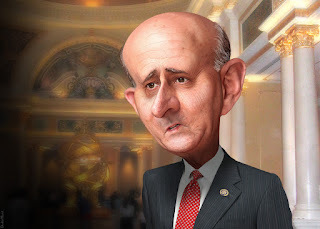 Caricature of Congressman Louie Gohmert. A Creative Commons licensed photo. Gohmert continued, "So don't make us keep food from the poor and starving children, if we even give them any at this point. Don't make us stop benefits for the elderly and sick, if they still get anything after all our previous cuts. And really don't make us disrupt programs to support America's veterans, because we totally support them and would hate to see that black president and Democrats hurt them." A joint statement from the Congressional Teabagger Caucus read, "It is not wholly the American people's fault that the GOP controls both houses of Congress, because gerrymandering and voter suppression played huge rolls in that. We are sure as hell going to make you all pay, anyway." The White House promised the Congressional Teabagger Caucus it would veto any legislation that attempted to defund Planned Parenthood, and expected the extremists to send President Obama just that type of legislation "about a half-dozen times or more."